T3's guide to the top tech to look out for in 2017! You've probably noticed that a new year is upon us, and in the midst of trying to clear away the Christmas decorations and get your New Year Resolutions off to a good start, you're probably wondering about the best tech and gadgets coming our way through 2017. Well, we've got you covered: read on for all the gadgets and gadget trends you can expect to see in all the categories that matter. From the smartphone you'll be carrying in your pocket to the self-driving car you won't be able to buy (yet), here's what's in store. Most of the major manufacturers have settled into an annual refresh for their flagship handsets, so predicting what's coming up is easier than it used to be: get ready for the Samsung Galaxy S8, the HTC 11, the LG G6, the Apple iPhone 7S (or iPhone 8? ), the Google Pixel 2 and offerings from the likes of Sony, Huawei and Motorola too. For everyone except Google and Apple, the start of the year is going to be busiest - keep a special eye on Mobile World Congress (MWC), which starts on the 27th of February, as this is where Samsung, HTC, Sony, LG and others will be out in force, maybe with a new flagship handset or two. Apple traditionally launches its new iPhones in September and it's likely that Google will bring out a new Pixel and Pixel XL shortly after (it stuck to a yearly cycle for the Nexus phones so there's no reason to think the Pixels are going to be any different). And what will this plethora of new phones bring with them? Expect technology like iris scanning, waterproofing and wireless charging to become more mainstream than ever, plus the usual bumps in terms of hardware performance, software optimisations and camera tech. A lot of the early rumours about next year's handsets have focused around curved displays, curved backs and bezel-free displays: there's even talk that Apple and Samsung will make their 2017 flagships with full-glass fronts, putting software buttons and even fingerprint readers underneath the screen so everything looks uniform. Oh and Siri, Google Assistant and other AI apps such as Cortana should all get another big upgrade in 2017 - these personalised digital assistants are becoming more and more important on phones and other devices, especially now phone hardware has hit something of a plateau. Tablets aren't quite the headline-grabbing gadgets they used to be but there's still enough interest in them for tech firms to want to refresh their line-ups during 2017. We're talking primarily about Apple and Samsung here, though it would be good to see a few more companies get serious again about this larger form factor. Apple will lead the way with some new iPad Pros and iPad minis: expect announcements around March time, though that's only an educated guess. We might even see a new 10.5-inch iPad, along with 3D Touch for Apple's slates (possibly). Consumers don't upgrade their tablets as often as their phones, so don't expect major innovations in 2017. You could be forgiven for being a little underwhelmed by Apple's MacBook Pro refresh at the end of 2016, but the Cupertino company may well give its premium, Touch Bar-enabled notebooks a specs refresh when Intel's new Kaby Lake CPUs are ready to reach the mainstream. Who knows? We might even get some new Mac Minis, Mac Pros and iMacs as well during the course of 2017, because Apple CEO Tim Cook has promised that "great desktops" are on the roadmap for his company. 2016 was a big year for Microsoft of course, with an updated Surface Book and a brand new Surface Studio unveiled to the world. We wouldn't be at all surprised if Microsoft decided to refresh both its laptop and all-in-one desktop near the end of 2017, with another set of improved hardware specs on board. The Surface Pro 4 is now more than a year old as well, and there's a lot of talk that the tablet-laptop hybrid is in line for a refresh in the early part of 2017 - possibly around March, when Apple could be planning to show off new iPads. And what of Google? Look out for better specced and better value Chromebooks through the course of the year - with maybe another premium Pixel Chromebook added to the mix too. 2017 might also be the year we see the merging of Chrome OS and Android, something rumoured to be under the codename Andromeda. We won't go into a detailed analysis of what Samsung, Asus, Acer, HP, Dell and the rest are planning for 2017 here, but stand by for another avalanche of laptops and 2-in-1s at every price point, many carrying the aforementioned Kaby Lake CPUs from Intel. The key tech expos to watch out for are the neatly acronymed CES (January), MWC (end of February) and IFA (September). We were treated to the PS4 Pro and the Xbox One S in 2016 but there's more in store for 2017 - Microsoft has teased details of Project Scorpio, its next-gen console, which is slated to be launched before 2018 arrives. It's apparently packing 6 teraflops of power and will even out-muscle the PS4 Pro in terms of raw performance. Meanwhile the PlayStation 5 looks an unlikely bet as far as the next 12 months are concerned. Outside of the big two we're getting the intriguing-looking Nintendo Switch in March - can Nintendo carve out a Wii-style niche in the market before Sony and Microsoft launch their next major console iterations? We'll know more in January when Nintendo has promised to share more details about the machine, and it's a good bet me might see a few more retro consoles like the NES Classic Mini make an appearance - from Nintendo and others. The big event of the year will once again be E3 in June and there are a host of titles coming down the line to get gamers excited, from Shenmue 3 to Red Dead Redemption 2. Covering them all would take an article all of its own, so check out our 2017 games preview for more on the top titles of next year. 2016 was a relatively quiet year for wearables, but they're not going away, and should be back and better than ever in 2017. Picking out individual gadgets you can expect is difficult, as there will be a whole host of them, but one of the strongest rumours around at the turn of the year is that Google will release two smartwatches of its own to welcome the arrival of Android Wear 2.0. As for Apple, it waited a year and a half before updating the original Apple Watch, and we suspect it may wait as long again before releasing a Series 3 incarnation - the Series 2 only just arrived in September and there just isn't the consumer demand to justify a new model every year. We may well see a significant software update in the summer though. It's a similar story with Samsung: the Gear S3 appeared towards the end of the year, which means the company won't be in any rush to bring out a successor. We might see a Gear S4 show up before 2017 is out but right now we'd only say it's a possibility. Another clutch of updated trackers from Fitbit is far more likely than a new Samsung device - the company has taken over Pebble, so look out for signs of that influence on Fitbit's hardware and software in 2017. It's hard to predict exactly what Fitbit will come out with in the next 12 months, so diverse is its range of gadgets, but we're certain that new trackers will be on the way. The HTC Vive, Oculus Rift and PlayStation VR all went on sale in 2016, so it could be a quiet year next year for virtual reality hardware, except for some more mobile headsets. Augmented reality could help to fill the void: the Microsoft HoloLens is on sale to developers now, and chances are we'll be hearing a lot more about it in 2017. 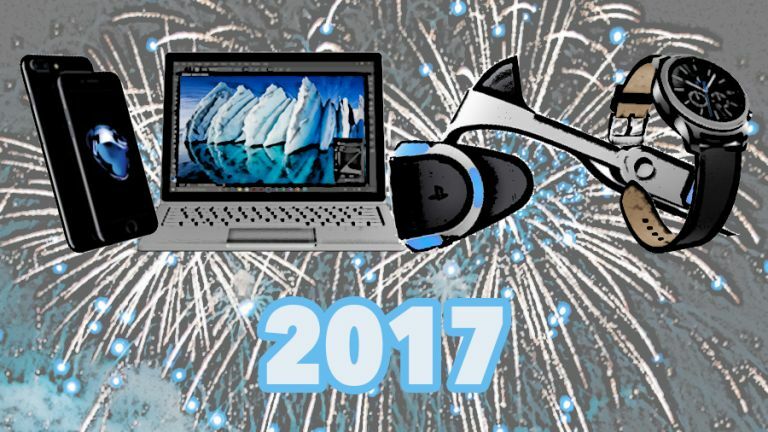 If 2016 was the year VR arrived, 2017 could be the year it becomes affordable. We know that Microsoft has already promised that a range of virtual reality headsets from the likes of Dell, Asus and Lenovo will be turning up over the next year, and at decent prices too - around the $299 (roughly £240) mark. Expect the usual avalanche of smart TVs too, with 4K remaining the very best standard to beat in 2016 as it was in 2017, and all the on-board software platforms getting just that little bit smarter through the course of the year. We should see a lot more Ultra HD Blu-ray devices appear on the market - and about time too - from the big names like Panasonic, Sony and Samsung. As you can see, it's going to be a bumper year for tech fans, and we've only really scratched the surface of what's coming in 2017. Expect a lot of great gadgets and one or two surprises to turn up during the course of the year, and of course the best place to read about everything that's happening will be T3.com. Asus ROG Zephyrus S GX701 review: the king is dead, long live the king! Key themes of CES 2017: what do they tell us about the year in tech?